If face paint is not your cup of tea, (we have a face paint costume of becoming halloween witch, then you will love this idea of becoming a scary halloween witch. Your awful transformation will lighten up that Halloween dress party. 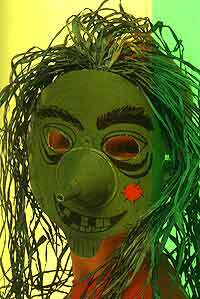 When you are through with this mask, don't forget to wear it with a black robe/T-shirt, and a broomstick made from twigs. Just scroll down, and discover the way to become gruesome this Halloween ! A pencil, and a black felt tip pen; PVA glue and brush; String, raffia scissors & elastic; Acrylic paint and brush; Paper plate, plastic funnel; Electric tape, colored paper. Draw a witch's face on the back of the paper plate, and cut it out. Cut out holes for he eyes. Place the funnel in the center, and trace around it. Cut the circle, slightly inside the tracing line. Glue the funnel over the hole. Undo the bundle of raffia, and cut it into long pieces for the witch's hair. Tie the lengths of raffia together at one end with a piece of string. Use a piece of electrical tape to fix the bundle of raffia to the back of the plate. Make a hole on each sides of the mask. Tie a long piece of elastic thru one end, put the mask on your face and cut the elastic at the right length to suit your face. Then tie the elastic to another hole. Presto! your witch mask is ready!